Dumped by text: How to quickly recover! Have you recently been broken up with, and dumped by text message no less? In this new age of technology men and women who no longer want to be involved in a relationship, take the easy way out and dump their ex via a brief and impersonal text message. If you have been broken up with in such a way, and are struggling to move forward, you have come to the right place. This article will help guide you on how to swiftly move forward and promptly recover from a separation after being dumped by text message. You’ll have to take some time to really evaluate what you feel for this person and whether or not you’re better off without them. If you do feel that they’re the one for you, don’t worry, there are methods that can be used for getting you back together, and if they are not the one for you, after a period of healing you’ll be feeling like a million bucks again! We are here to help guide you every step of the way throughout this painful and frustrating time, so let’s get started with figuring out what all of this means! All partners are not made equal. Some people are more shy, introverted or do not know how to handle conflict. Some simply are afraid of hurting a person that they once loved and others are simply looking for the easy way out. There are a multitude of reasons that could explain what pushes someone to break up with their ex-lover in a manner that is as impersonal as being dumped by text message. More importantly however, most of the people that have been broken up with in that way are left without a detailed explanation of what went wrong or at the very least, left wanting more of an explanation. That is a normal reaction to have, and a crucial point that we will encourage you to swiftly find an answer to. As such, we will ask you to focus less energy on trying to rationalize the way by which you were broken up with and focus your more on the reasons that pushed him or her to end the relationship all together. It is your right to know what went wrong, and your ex partners’ last moral obligation to give you a reason for the separation, no matter what that may be! A person needs to understand why a break up happened for a variety of reasons ranging from gaining closure, to knowing what to be careful with in the future. No one is perfect, so if you learn that one or many of your actions led to this separation, you’ll know what aspects of yourself need a little bit of work. Think of it as a very important learning opportunity that will ensure that you will be much happier in the future! Another important thing to do is to ask yourself if your ex had some serious communication issues. You don’t want to end up in a similar situation in the future, so recognizing warning signs is always beneficial. Again, as painful as this whole thing is, at least it’s providing you with valuable lessons and information! Once your ex has given you a rational explanation for his decision to end the relationship or why you were dumped by text, we advise you to stop reaching out to them and to even cease all casual conversation all together. Looking to stay friends or checking in from time to time before you have fully moved on will only bring you further pain and suffering. If you’re always reaching out to them or seeing them, it’s pretty much like twisting the knife in the wound. You’re constantly being reminded of your relationship and of the heartbreak. We are aware of how difficult it can be to not reach out and seek a second chance. More than just self-discipline, we will advocate for self-respect and self-value. Don’t give your ex that power over you and that satisfaction to know that you are still at their mercy, despite the fact that they decide to breakup with you and that you were dumped by text message no less! The quickest way to recovery will be for you to move forward while focusing on yourself and to look for tools to help you be at peace and activities that enable you to stay busy and positive. Take some time to pick up old hobbies that brought you joy in the past that maybe you’ve gotten away from while you were in a relationship, spend time with people that make you happy, focus on your personal and professional projects and really excel, go to the gym and get those endorphins flowing. If you want to, you can even give yourself a makeover! Focus on your happiness right now, and things will start going your way. Social media has become such an essential communication platform that it is difficult to live without these tools. We will not advise to stay off of Facebook or your other favorite social platforms, but we strongly encourage you to block your ex out completely. Furthermore if you have mutual friends or connections that will make your ex appear inadvertently as part of your timeline or in other ways, we advise to block those “intermediary friends” as well. It might feel heartbreaking while you do it, but trust me, you’ll begin feeling better as soon as you have less reminders of them popping up left and right! This is not about them and more about you. You need to create a safe haven, or the necessary space to once again find yourself without being polluted by the negativity that surrounds your ex. People fail to realize that breakups should be all about themselves, (but in a positive manner), and not about their ex. Switching the focus from them to you is a huge game changer. Although these are tremendously challenging times, it is a unique opportunity to assess changes that you would like to implement in your own life. The less time you spend surveying your ex’s photos and whereabouts on social media and the more time you will spend focusing on turning a bad situation into a life changing opportunity! 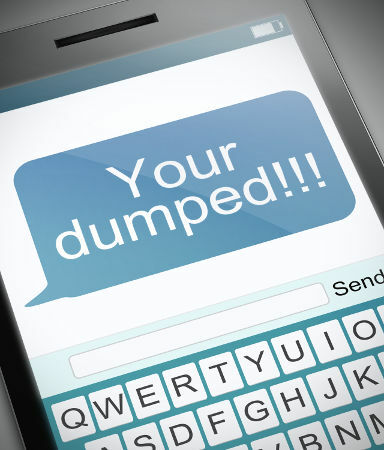 Dumped by text: a blessing in disguise? From our experience, when someone is dumped by text message, the person that is being broken up with has more to offer than the one who triggers the separation. Of course, it usually takes a bit of time for one to realize that the break up they suffered was actually a blessing in disguise and an opportunity to find a better and more compatible partner. As such we ask you to find comfort in knowing that you are not entirely to blame, and that you can move forward knowing full well that the love of your life is most probably in your future and not in your past. What if I still really want my ex back? Of course, each situation is unique and perhaps there is a real reason why your ex needed to end things via text message and you can’t help but feel the desire to be together again. The best thing to do in order to be sure if seducing your ex again is a good idea would be to get in touch with us directly. Together we can help you figure out if this is really the right person for you! If it turns out to be the case, there are certain steps to follow and you’ll need to be patient, motivated, and in control of your emotions. You’ve been hurt so it’s easy to feel overwhelmed, but we will help you to get back in control of your life so that you can become as happy as possible, with or without your ex! Don’t hesitate to leave a comment below with any questions you may have and we’d be more than happy to personally reply to you.